Waxaan kuusoo diraayaa salaan kasoo go’day beerka iyo wadnaha. Literal translation: I am sending you greetings that have emanated from my liver and heart! Actual translation: Greetings from the depths of my heart. 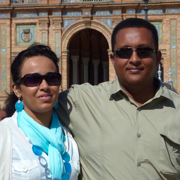 For Somalis, it’s not just the heart that flutters with love, so does the liver. Somali singers include lines like: Beerka iyo wadnuhu ani saw ima babbanayaan ([My] liver and heart flutter [with your love]). How romantic! 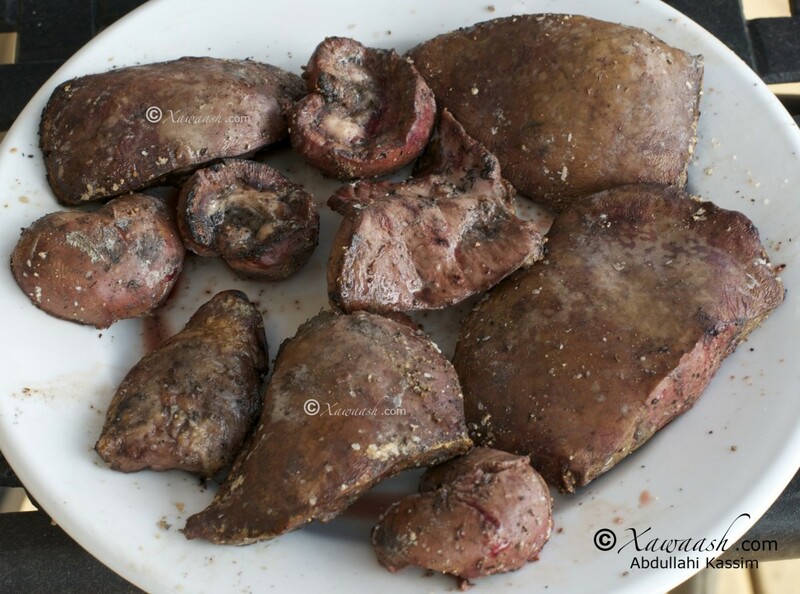 When it comes to food, Somalis consider the liver as precious and they offer it to guests of honour. 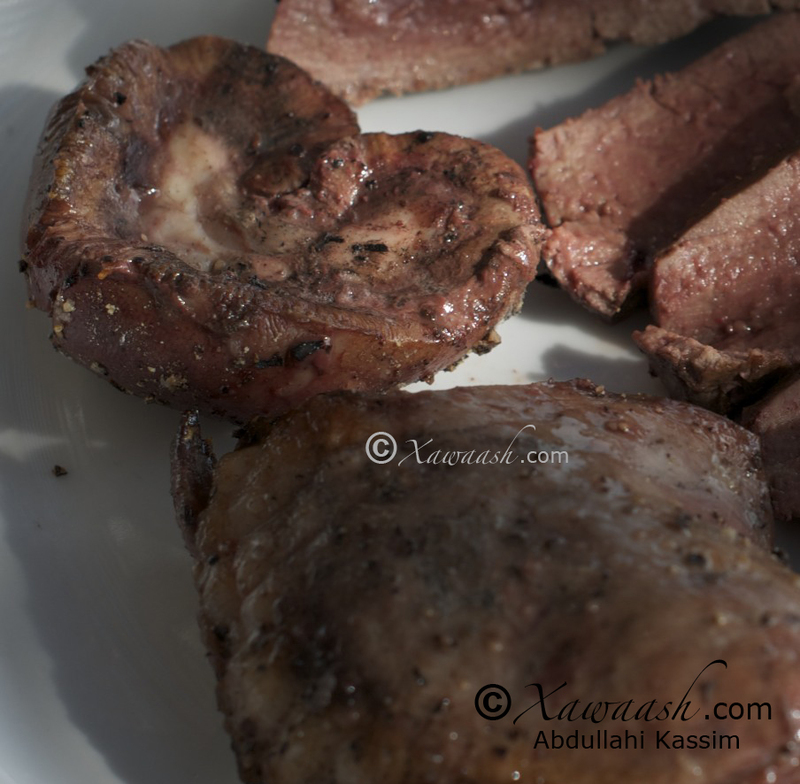 When a guest arrives at your home, you offer him the liver while the rest of the meat is being cooked. 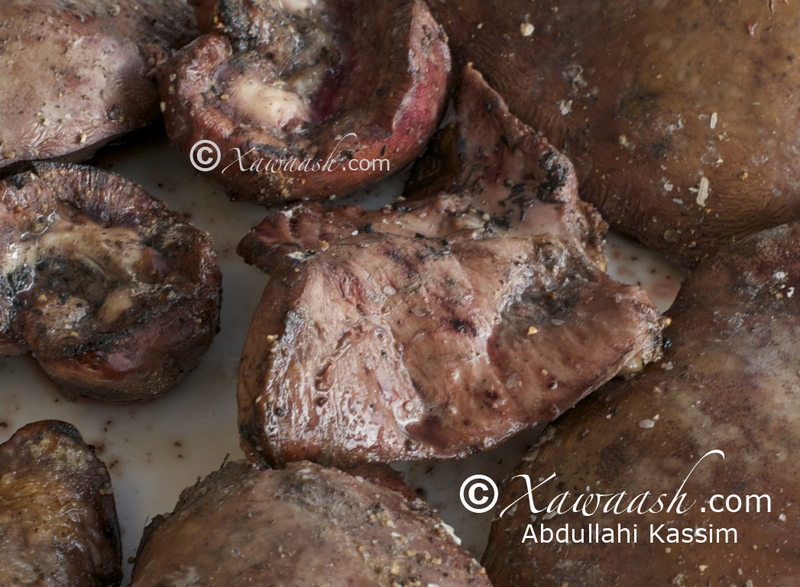 Usually the liver is grilled directly on hot charcoal. It is seasoned with salt and pepper only. It is natural, it is delicious, and it can’t get simpler than that. 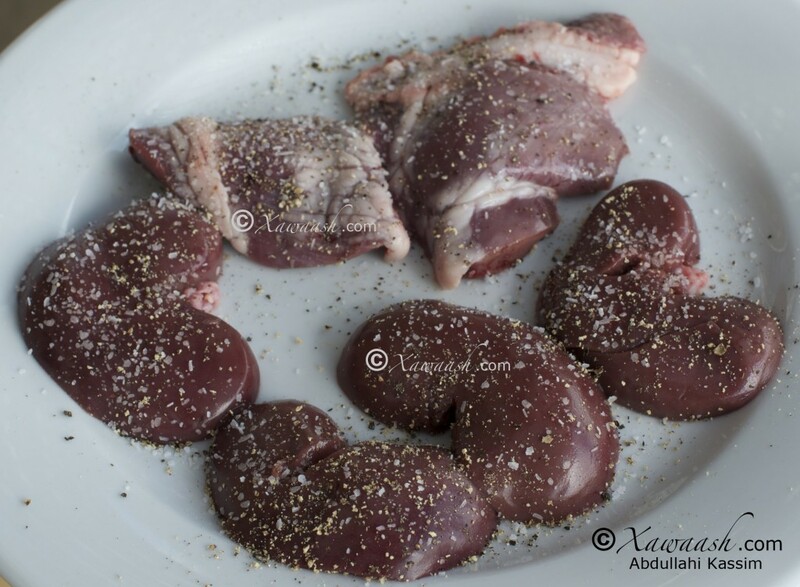 Cut the liver into pieces of even thickness, about one inch thick. Cut the heart into quarters and cut the kidneys lengthwise in half. Wash them well with cold water, then pat dry. We did not soak them in brine or milk since it takes away from their natural flavour. Season with half the salt and pepper on one side. Do not use oil when cooking directly on hot coals. Choose good quality, hardwood charcoal. 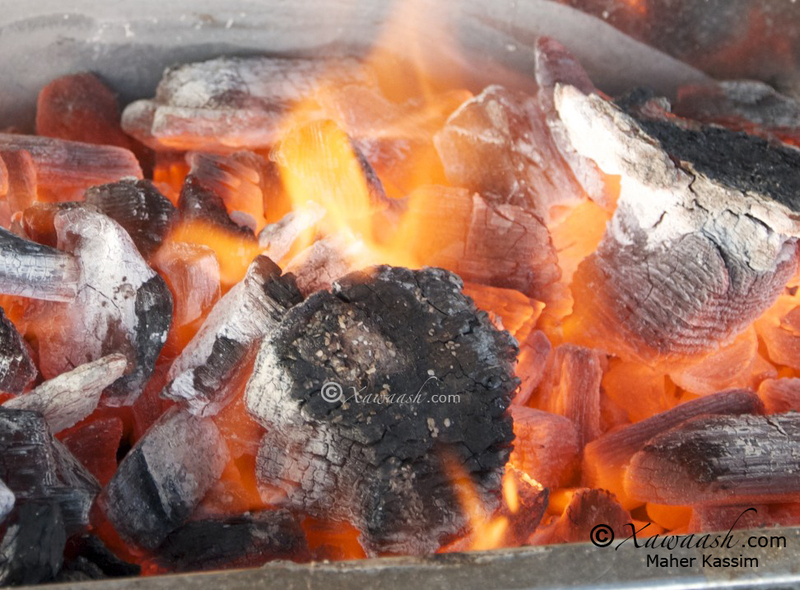 The charcoal must be natural and you must avoid using lighter fluid. To light the fire, we put a few lumps of charcoal directly on the flames of a gas barbecue. When the coals become red hot, blow away the top layer of ashes. 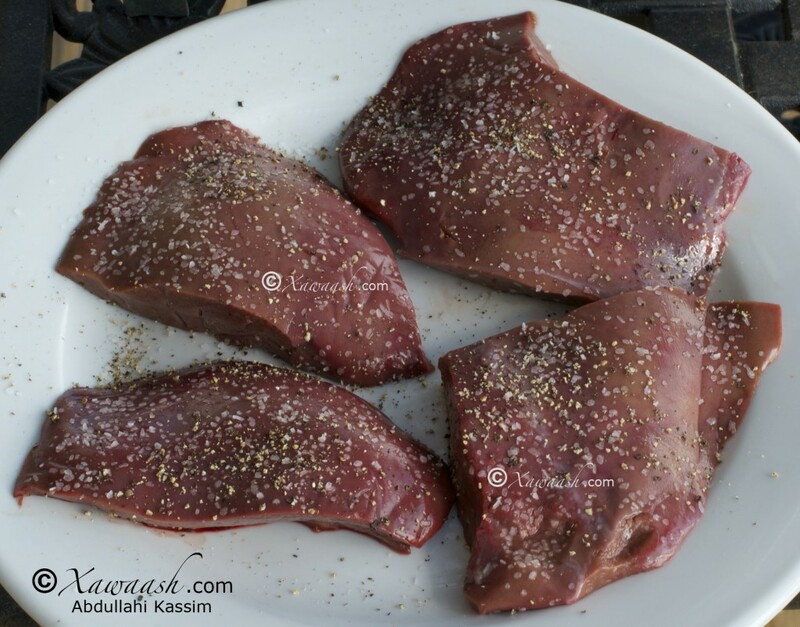 Using tongs, place the liver, heart, and kidneys directly on the hot coals. Cook for two minutes then turn. Season with the remaining salt and pepper. Turn again after two minutes. Cook for one or two more minutes, depending on your preferred level of doneness, but do NOT overcook. Serve immediately. One of the things I’ve always wanted to try making. You have inspired me to make some really soon. Thanks for sharing such a healthy and delicious looking recipe. love your introduction too. Beautifully said! Thank you very much! I do hope you try this recipe and I assure you that you won’t be disappointed. 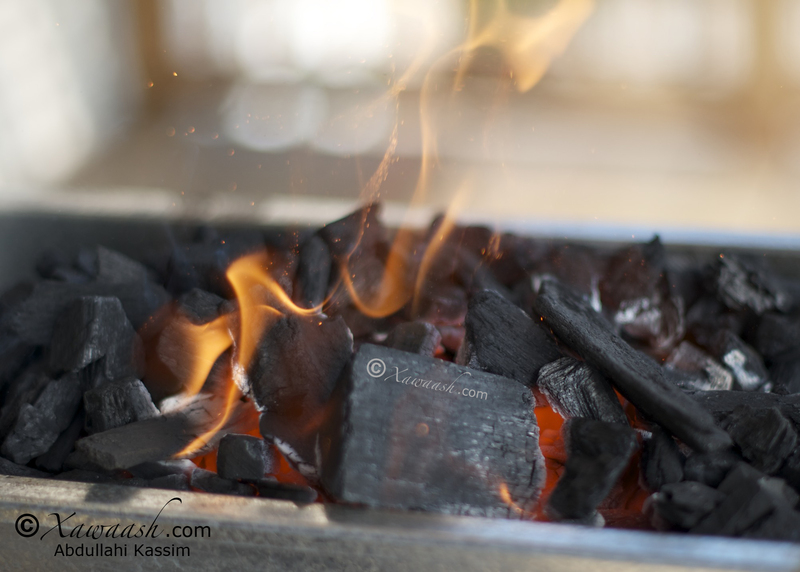 Cooking directly on charcoal imparts a flavour than can’t be replicated with any other method. The kidneys were to die for. They were salty, peppery, with a crunchy exterior and a moist, juicy interior. Just delicious! Thank you for visiting Xawaash.com and thank you for all your comments. Thanks so much for making this website. I’m starting to learn how to cook somali foods and this is very helpful. Please keep up the good work and continue to make somali foods. Thanks for the nice comment. We will continue, God willing. I am so inspired to see so many Somali dishes, keep them coming and congratulations for a job well done! Thank you so much for your comment and for your kind words.